Napturale Living - Page 2 of 4 - Food. Fitness. Art. Life. Whether you have designer taste on a pauper’s budget or you just want to try out the latest fashion jewelry before adding it permanently to your collection, Rocks Box is the perfect answer to your needs. Rocks Box is like a personal jewelry stylist for those of us who want to live like rock stars but without the annoying paparazzi. Every month you can try as many pieces as you like and discover the latest designers from Isharya to David Aubrey. Subscriptions range from $180 upfront for a year, $100 upfront for six months or $19 for a month by month subscription. Whatever your needs are, Rocks Box has you covered. Each subscription allows you the freedom to cancel at anytime making it even easier to try out all of the newest fashion trends without the obligation to buy. It’s that easy. Try out everything and only purchase what you fell in love with. I had the opportunity to try out this service during the month of September for free using a code sent to me by my sister. Initially it got off to a rough start because the wrong subscription went through during the setup process. But no worries. As soon as I saw what happened I emailed Rocks Box and received a reply back the very next day. My funds were returned within a few days after that and the correct subscription was applied immediately after the email was received. To get a better feel for what your preferences are Rocks Box has you to complete a short questionnaire and then they use this information to hand select designer pieces for you to review. Each box contains 3 items each which are kept neat inside of a cute white box with pink ribbon. My very first Rocks Box selections weren’t that appealing to me. I would have to admit that the selections did match what my questionnaire stated but I didn’t really care for the actual pieces themselves. You can view a quick Vine video below of the first selections. My second box was a little bit better but my third and final box was the best of them all. I found it very hard to send the last box back. Unfortunately I don’t have the exact designers that created each of my pieces because I’m a doofus and I lost my box inserts which gave the names of each piece, the designer and the price for each item. However, I’m sure you could contact Rocks Box if you are so inclined to do so and obtain that information. Or better yet, use the below link and try it out for yourself. For me personally, if I were ever to continue this subscription I would only do so at the monthly cost and I wouldn’t really buy many of the pieces. 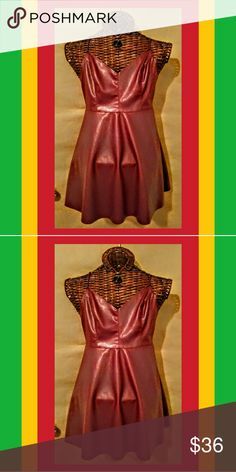 The prices were a bit too high in my opinion and some of the pieces felt more like costume jewelry than high priced fashion pieces. I’m really frugal and I can’t justify paying over $10 on costume jewelry. That’s just my opinion though. If guys do decide to try out this service or if you’ve already tried it, please don’t hesitate to come back here and tell me what you thought of it. I look forward to hearing from you! I received an awesome opportunity via Tomoson to review a healthy food product made by Immortal Herbs. As you all may already know, I’m trying my hardest to lose weight and maintain a healthier lifestyle, so when I received this opportunity I was ecstatic. I love green juices because they are so beneficial for helping to get the day started. They give a great boost of energy and you can pack so many nutrients into just one class of juice. Not to mention they are awesome colon cleansers and while that may sound gross it’s very important for overall health as well as weight loss. I truly feel like Immortal Herbs claims are true. It’s packed with healthy all-natural ingredients such as: Barley Grass, Wheat Grass, Spirulina, Spinach, Alfalfa Leaf, Kelp, Dulse Leaf, Barley Grass Juice, Orange Peel, Beet Root, Dandelion Leaf, Lemon Peel, Gingko Leaf, Wheat Grass Juice, Maca Root, Cacao, Ashwagandha, Sacha Inchi, Manuka Honey, Bee Pollen, Reishi Mushroom, Blueberry, Black Currant, Wild Bilberry, Wild Lingonberry, Aronia, Pomegranate, Concord Grape, Red Raspberry, Sour Cherry, Wild Elderberry, Wild Cranberry, Black Raspberry, Goji Berries and Schiznadra Berries. With all of that goodness inside you can’t help but feel great! I felt so energized after drinking just one glass of this superfood formula for breakfast. And that’s saying a lot for me because I am in no way a morning person. I decided to try the formula with water only because I wanted to really get the true taste of the product without anything else mixed with it. It had a very herbal, earthy taste and just a little bit grainy which isn’t a bad thing considering the ingredients. I continued to feel energized until lunch time which I was very pleased with. I don’t usually eat breakfast which is a bad habit I need to break. I’m not usually hungry until around lunch time but missing meals does the opposite when you’re trying to lose weight or even just maintain a healthy lifestyle. Plus, I don’t like having to cook in the morning because I’m really not excited about being awake. I know, it’s sad, but it’s very true. Products like Total Nutrition make it really easy for me to have breakfast without all of the extra effort. I fulfill all of my needs with just one glass a day, so it seriously doesn’t get any better than that for me. I encourage you guys to give this product a try. Maybe even try this recipe that they included with the product. It sounds very yummy! You can get daily updates from their Facebook page and Twitter. Again, visit their website for even more information on this awesome Superfood Formula and check out their entire line of products as well. Be sure to come back here and tell me what you thought of the product and what benefits you derived personally. Preheat oven to 375 degrees and allow the pie crusts to thaw while chopping the vegetables. In a medium skillet heat olive oil on stove top at mid-high heat. Once the oil is ready saute the onion and garlic for 3-4 minutes or just until onions are slightly translucent. Next add in the chopped bell peppers and cook for another 3-4 minutes, stirring occasionally. Stir in entire package of baby spinach and stir until leaves have completely wilted. Lastly, add in the cherry tomatoes and season with 1 tsp. salt and 1 tsp. black pepper. Cook for another 2-3 minutes. Using a slotted spoon, fill pie crusts with vegetable mixture. In a medium bowl, beat 4 eggs. Add in the milk and season with remaining salt and black pepper,2 tbsp. parsley and oregano. Mix well then pour egg mixture over the vegetable mixture. Sprinkle the grated parmesan cheese evenly over both pies followed by the feta cheese. Next sprinkle the shredded cheddar cheese evenly over both pies and top it off with the last tablespoon of parsley. Bake uncovered in preheated oven for 30 minutes. If you like the cheese browned a little bit more, bake for an additional 5 minutes. Allow the pie to set 8 to 10 minutes before serving. I hope you guys will enjoy this dish as much as my family and I did. Be sure to comment below and tell me what you thought of this awesome Quiche. Hope to hear from you soon! What You Been Up To?? It’s been a while since I last posted and I won’t offer anymore apologies because honestly I’ve done that a bit too much. What I will do is fill you in on what I’ve been up to during my hiatus. Ever since I started this blog I have searched high and low for a template that I thought embodied the overall feel of my blog. I needed something that looked organic and natural. Something that was still famine without being too girly. And most of all something that was very eye-catching in that it would draw attention to all my blog’s best points. I was pleased to stumble upon a blog design created by fellow blogger and entrepreneur The Pixelista, which can be found on the Studio Press website. The design was everything I wanted for my blog and then some. I also worked with RFE Hosting, which is an awesome company that specializes in web hosting and a list of other services including Blogger to WordPress migrations. The entire transition from Blogger to WordPress and the upgrade of my site was so seamless and stress free. Anything I needed help with, both The Pixelista and Aaron at RFE Hosting, were right on top of it and made things so simple to understand. Outside of taking care of my blog I also had the opportunity to try out some really awesome subscription boxes. This was a really great experience and gave me a great way to try out lots of new products for just one monthly price. I loved all of the subscriptions boxes that I tried but my two favorites were Klutchclub and Love With Food. There will be a more in-depth review coming soon of each subscription box I tried. The rest of the time away from the blog was used to spend time with my family that I love so dearly and to take care of some personal matters that I have been neglecting. I firmly believe that while blogging or owning your own business has its joys, things will fall out of line if you don’t take care of your personal needs and your close relationships. Everything has its proper place and what I’m learning to do now is to prioritize which is important in all aspects of life. Anyhoo, I’m super excited to be back on top of things now. I have so many wonderful things planned and can’t wait for you all to be apart of the next phase of Napturale Living. Picture is not my own. No copyright infringement intended. I can certainly attest to the statement above. I have always been really shy and awkward but it wasn’t until I decided to ‘go natural’ that I began to come out of that shell a bit. I think in today’s world it does take a lot of confidence to do something that is different from what is popular or even acceptable. Even more so if those of your own race don’t really embrace that decision as well. When I initially began allowing my natural texture to grow out there wasn’t this huge phenomenon of natural hair loving Black women parading the streets. It was nothing at all like what we see now in 2013. So at that time it took a lot guts to do something that was different, something that went against the grain so to speak and stick to my decision. Besides that ‘going natural’ opened up a whole new world of creativity for me. I learned a lot more about how my hair and the proper way to take care of it in order to yield the best results. It gave me a new way to express myself and find out what I liked as well as what I didn’t. In a lot of situations my hair was a conversation piece that allowed me to meet people and share tips on how to care for it and new styles to try. Now in no way am I saying that ‘going natural’ is the only way to gain a measure of confidence. The point is simply that change is definitely good whether it’s a new hairstyle or new clothes. And when you make that change it’s important to stick to it if it’s making you happy and improving your quality of life. Changes like these can even catapult you into a totally different direction that you may never have thought about before. For me, that extra push was because of my hair. What about you? 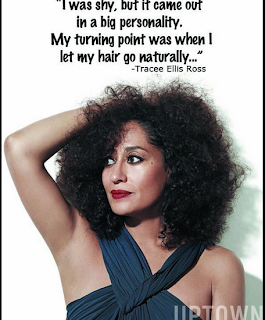 Has ‘going natural’ helped you in any positive ways? Was it a positive or negative experience? What other changes have you made that helped increase your confidence? To kick off my weight loss I decided to start with a green juice cleanse. It’s a really great way to detox the body and repair its ability to digest and absorb nutrients. Juicing also helps your body to consume the recommended amount of fruits and vegetables as well as to aid the body in fighting off disease. Not only that but juicing also helps to increase energy.Since I am still a newbie to juicing and cleansing regimens, I chose to start with a short three day cleanse just to get my body used to the process. Maybe in the future I will do a full seven day cleanse. I purchased all of my ingredients from my local Aldi and mixed my concoction using my food processor. Before hand I made these really cool spinach ice cubes that I saw on Pinterest. For my juice recipe I used about eight of these cubes, 1/2 cup frozen strawberries, 1/2 cup frozen pineapple, 1 1/2 cups of water and 1 scoop of Life’s Basics Plant Protein Powder by Lifetime. This filled about 3 1/2 small mason jars. started the day by drinking a cup of green tea with no added sugar. An hour later I followed up by drinking one jar of juice. Throughout the remainder of the day I continued to alternate one jar of juice then one full glass of water. Doesn’t look very appetizing but it was, lol. The juice was really good and very filling. I was actually surprised that I did not have any cravings for solid food until the third day. On day three I ate a huge salad made of mixed greens and fruit with a light vinaigrette dressing. I was so proud of myself for having finished the full three days and so excited to try this again soon. If you guys have ever done a green juice cleanse, please comment below and share your experience or any helpful tips you may have. I can’t wait to hear from you! My sister and I came across this recipe one day while watching one of our favorite Food Network shows, Restaurant Impossible. On season five episode thirteen, host Chef Robert Irvine visited failing food establishment, Sweet Tea’s Restaurant and Catering. 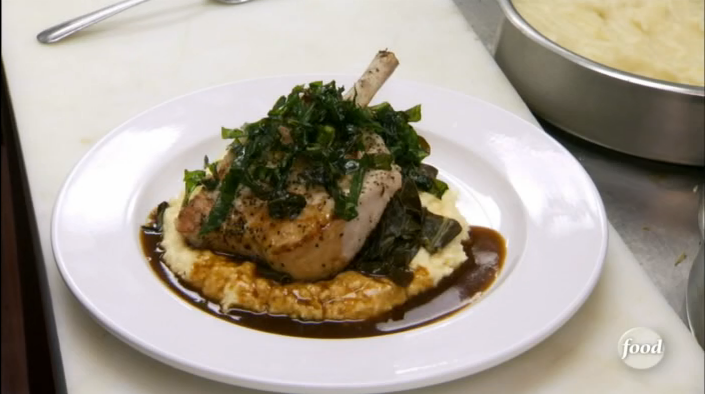 Of the many recipes created during this episode the one that really captured our curiosity was the pork chop, grits and greens platter. It was such a really nice and delicious twist on southern favorites all on one plate. Top photo is the sole property of Food Network. No copyright infrigement intended. My sister recreated this platter last night from memory. I think she did a really great job considering we didn’t find which episode included this dish until after she’d served it for dinner last night. We never really ate grits alongside greens before but we found this dish to be quite appetizing. Unfortunately this dish is no longer served at Sweet Tea’s Restaurant and Catering but their current menu is still mouthwatering to look at. If you’ve ever visited Sweet Tea’s be sure to comment below and share your experience. I would love to hear from you!! You can find recipes like these and more on Food Network’s website and be sure to watch Restaurant Impossible every Sunday at 10pm/9c. If you guys haven’t already noticed, I really love Pinterest. I could seriously waste half an hour to an hour a day on this site just pinning recipes, DIY projects, hair inspirations and whatever else catches my eye. One of my most favorite things to pin are funny and inspirational quotes because you never know when you’ll need that extra bit of encouragement or that gut-busting laugh to help you get through the rest of the day.One day I happened to come across a pin by a Naturalista by the name of Kelli Benson. I had to laugh because I have felt this way so many times and I seriously wanted to scream this at the top of my lungs. It’s nice to get compliments on your hair however it is not nice to have people touching it and sometimes ruining your perfectly shaped puff. I don’t know about you, but it’s an art to those things and once you have gotten it the way you want, you don’t want anything ruining that look. Not to mention people’s hands are dirty and most if not all do not take the time to sanitize their dirty mitts before touching your hair. I’m just saying. This PSA should have been made a long time ago. We should probably run a few commercial slots proclaiming our displeasure with people touching our hair. That was my tiny rant for today. How about you guys? 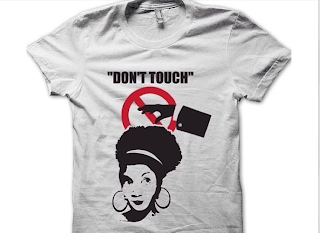 What are your thoughts on people touching your hair? Be sure to comment below and share your thoughts with me.